Well, you won’t believe just like us, but its really happening. Three carrier of UK has start selling most awaited unicorn color White iPhone 4 on their online store. They just pushed up the White iPhone 4 deal, and made available for purchase on its website. 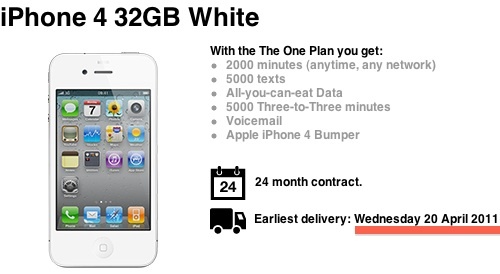 They also providing “earliest delivery” service to get your hands on White iPhone 4 on Wednesday, April 20th. Well on reading this we are to shocked or thinks that this deal is up due to an error, because recently some main sources rumors that white iPhone 4 will launch in the end week of April and also the spokesman of Three, says that the deal is not yet live and that they do not yet have any other information on the white iPhone 4.